My Spring Break, and I miss my friend. It was Wyatt’s trip. Wyatt is gone, but it was still his trip. He loved to paddle down a river, looking for adventure, testing his endurance, lost in the comfort of the wilderness. For Wyatt, he was at his best and at his happiest when lost in his wild home. He treasured his genuine relationship with his wilderness, giving it all of his energy and attentiveness. Each moment was theirs. As I paddled down the Suwannee River with four of our friends and colleagues, I felt my missing friend, an empty place deep in my gut – like a hunger that will not be satisfied. Yet, at the same time, I felt closer to Wyatt because I was in his wild place. It was when I was attentive to Wyatt’s wild comforting home that I could hear his paddle strokes next to mine. And that made me feel good. 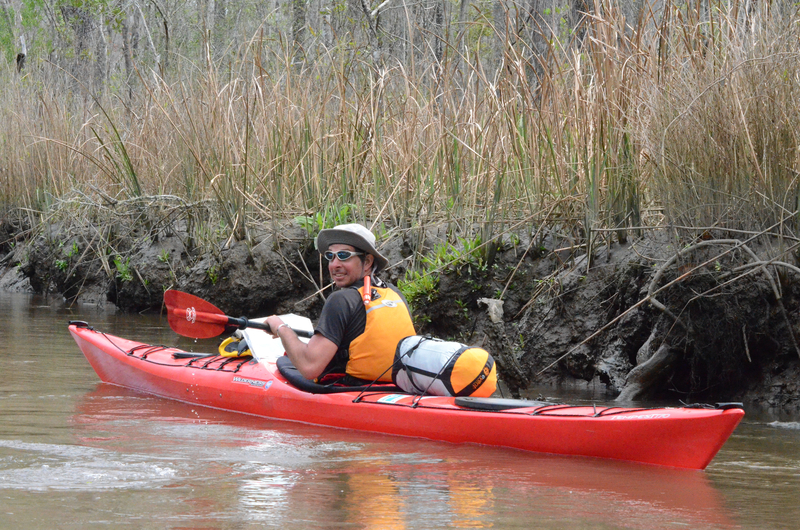 Wyatt 2012 – paddling the Altamaha. Wyatt Pasley: teacher, adventurer, lover of the wilderness, and friend. This entry was posted in Uncategorized and tagged nature, outdoors by Peter Emmons. Bookmark the permalink. very well said. I’ve now read this about four times and it gets better every time. Thanks so much Peter! Said so beautifully. He really was at his best in the great outdoors and I am so glad you got to know that part of him!